Hoy les traigo un post un tanto corto puesto que llevo unos días de locura y en unos momentos tengo que salir pitando al 080 Barcelona!! Yeiii!! Pero en fin, como en estos días está haciendo tanto calor, lo único que apetece son prendas súper cómodas y fáciles de llevar, así que hoy les dejo algunos looks con monos, perfectos para esos días en que te apetece ir con un aire más desenfadado e incluso para esas noches de verano muy calurosas, lucirán geniales si los acompañas con unos taconazos! Today’s post is a little bit shorter because lately I have been full and in a while I have to run to 080 Barcelona!! Yay!! 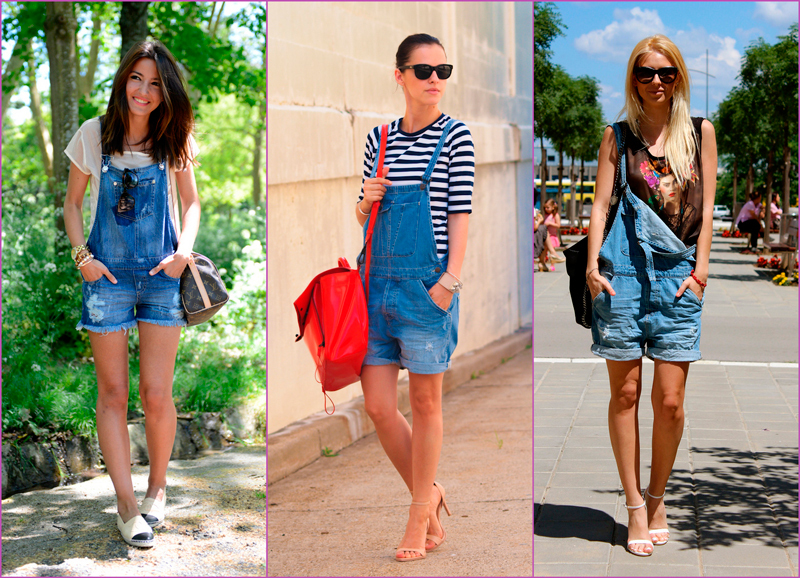 But anyway, since definitively these days are being really hot, we only want to wear easy and light clothes so today I leave you with some dungarees looks, perfects for hot weather and even wearables for those hottest summer nights, of course, always with high heels! Los petos jeans están siendo todo un must esta temporada, yo verdaderamente me he vuelto súper fan de ellos y me encantan como se ven con tacones o con looks más informales, así que era de esperar que saliera la versión corta, perfecta para la época de más calor! You know that this year jean overalls are a must and I have become a real fan of them, love how they look with high heels or in more informal looks, so it was to expect that the shorter version of them also conquered this season! También tienes las opciones un tanto más frescas e ideales para cuando el calor arrasa! You also have the more light versions, perfect when hot becomes unbearable! Estas opciones son ideales para un plan más elegante por la noche! These options are great for a more fancy summer night plan! Y si no te acaba de convencer el rollo mono en shorts, aquí hay estas opciones con falda! And if this kind of overalls or dungarees don’t convice you at all, try on the skirt versions! Que les parecen estas opciones? Les gusta la opción mono o peto corto para el verano? Les va más el look informal con jean o prefieren los monos de tela? What do you think about these options? Do you like these type of garments for summer? You prefer the jean version or the ones in light fabrics? Fotos / Images: Bartabacmode, My Daily Style, Lovely Pepa, Bittersweet Colors, Zorannah’s Fashion Corner, Something in Navy, We Wore What, Marilyn’s Closet, Nany’s Klozet, Necklace of Pearls, Native Fox, Revolviendo mi Armario, Seems of Desire. Yes, I would say these are perfect for hot weather! Y doblemente!! 😉 Ya te dije que seguro te verías más por aquí!! Love your style!! 🙂 Un besote!! !